Every workout you do should be both mentally and physically challenging. Since your body should be actively changing every four to six weeks it’s absolutely imperative that you monitor the variety and intensity of each workout. It is based on this premise that I have created Try Fit Weekly Fit (#TryFitWeekly). Each week I will try one new workout to complete, review and write about. The point of each review is not to become an informal Yelp, but instead to give you a firsthand account of my experience* trying new forms of training. Mixing up your training every week helps to combat boredom, helps you meet new people and keeps your body in a constant state of change. I want to encourage you to try your own Try Fit Weekly challenge and give me feedback based on your own experiences! Let’s get the ball rolling and watch our bodies change! 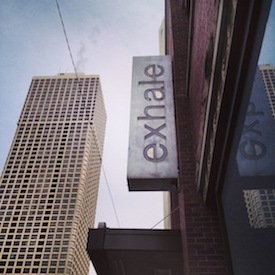 While having practiced yoga for nearly four years, I had never taken a yoga-based sculpt and/or cardio class. 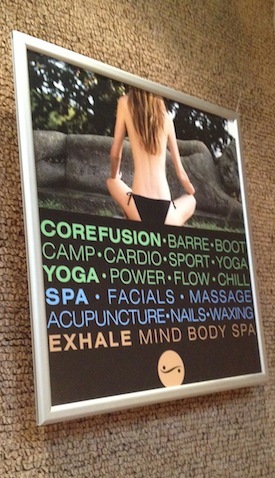 Enter Exhale Spa’s Core Fusion Cardio. The spa itself is a spiritual urban oasis with its calming décor and a seemingly endless list of spa services. But when I walked into the main studio, I felt transported. This very hip, zen space makes you want to roll out your yoga mat and never leave! After grabbing my two to three pound hand-weights, I wondered how tough a class like this could be. Since I generally lift fairly heavy weights, I was a little skeptical. But as Andrew began class, I suspected his exuberant energy wouldn’t let us get away without a great workout! After a quick warm-up, we dove into mountain climbers, yoga moves, boxing punches, lunges with shoulder presses, leg raises in a forward fold and balance work. During one of our first plank holds, he had us pulse-squeeze our inner thighs together. This simple cue entirely changed how I held the pose. I could feel my lower abdominals engage and it left my inner thighs sore the next day. One of my other favorite exercises was the Chair Pose Twist with movement. While sitting in Chair Pose with hand-weights in our hands, Andrew had us twist right and left while briefly resting our elbows onto each thigh. Holy transverse abdominals! Throughout class, I made a note that he did a great job making sure we worked every muscle group. I often find classes only focus on the front parts of the body and vary rarely get all opposing muscle groups. So this was great! Overall, Core Fusion Cardio was challenging without being overwhelming. I’d say this workout was great for any levels and good to do one to two times a week!